Paintballing can be all fun and exciting, but you would easily miss this experience in case you don’t have a pair of painting ball gloves. It just takes one shot on the knuckles to ruin your day. While there are a plethora of these gears in the market, you want to settle for nothing other than the best. In this article, the top 6 best paintball gloves 2019 are explored extensively to make your purchase easier. Manufactured by unique and exclusive military grade fabrics, these gloves are all you need for your paintballing activity. They comprise a stitch line which helps you to leave some part of your fingers out. Also, you don’t need to worry about using your phone while with the bunker kings supreme, full fingers paintball gloves because they are designed with high tech smart touch fingertips making it possible to use your phone wearing them. These gears come with padded air mesh incorporated with super slide pads. They are totally breathable so, they’ll keep your hands dry. You will need a BK Crown Pull Tab for easier removal of the gloves. Convenient for everyone as the stitch line allows you to either fully cover your fingers or leave them halfway out according to your preference. You can smoothly operate your phone while wearing gloves. Comes in a variety of colors Feels like a second set of skin. It may be challenging to remove them in the absence of a BK Pull Tab. 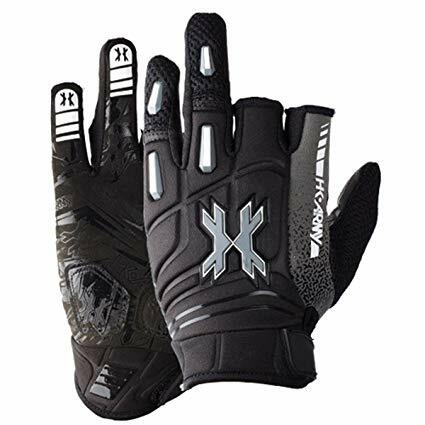 Weighing only 8 ounces, HK Army paintball 2014 Pro Gloves are a must add to your next paintballing game kit. Although they feel intact on your fingers, they are very comfortable and highly durable due to its formfitting design. They comprise low-profile velcro which enhances its easier removal. These paintball gloves are designed with two open fingers which allow for optimal rapid firing. 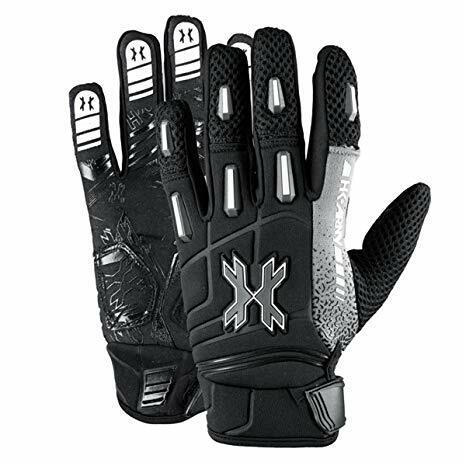 Besides their aero-mesh ventilation, their neoprene-padded hands give 100% protection. Very easy to release due to its TPR logos and low-profile Velcro. It is lightweight Highly durable. Very comfortable although it has a formfitting design. The fixed two open fingers may be a turn off for those who want all the fingers covered. 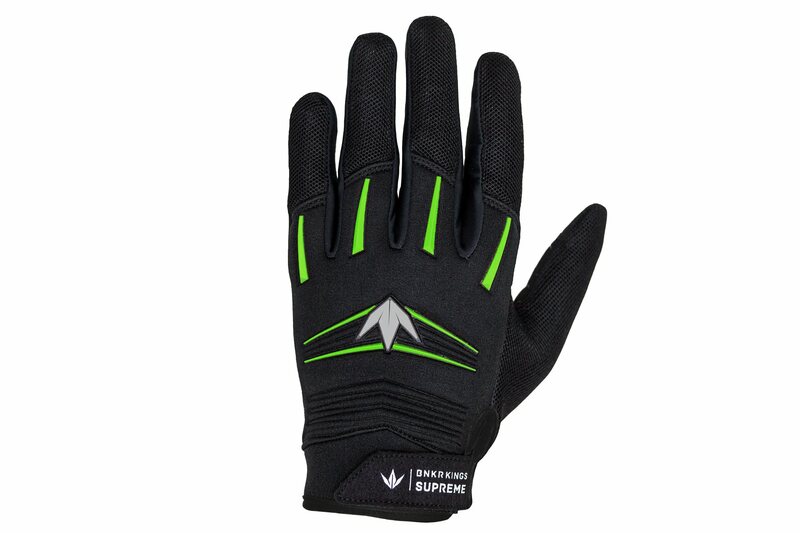 Similar to the previous glove, the exalt paintball Death Grip Gloves has two open fingers favoring optimal rapid firing. Along with this, the product has a synthetic leather palm as well as a neoprene exterior which offer utmost protection to your hands. It has a 3-0 rubber bone structure which absorbs, impacts and flexes with your hand movements. They are also manufactured with ultra-durable rubberized palm for your protection. You sure don’t have to worry about losing your grip on your hand with this paintball glove. Offer 100% protection to your hands Extremely lightweight as it weighs only 3 ounces. The leather designed and that provides extreme comfort. The two open fingers may not work well for all. 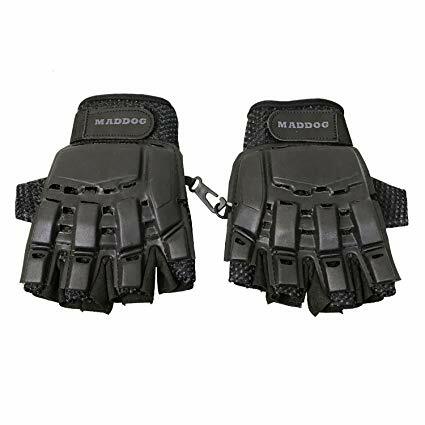 Maddog Tactical Half-Finger Paintball Airsoft Gloves are perfect for paintballing and other similar activities including airsoft and military. It is designed with half free hands which offer an ideal fit at their top. They are designed with a mesh fabric that provides ample ventilation. The padded palm will blow your mind because it does not only offer comfort and protection but maneuverability. It also comes with an elastic strap at the bottom which fits securely to your hand. Highly durable due to its fabric material and highly padded palm. The strips can be easily adjusted to your preferred size. The glove can be used for a variety of activities similar to paintball. Unsuitable for people who would prefer fully covered fingers. If you have minimal cash and still want a quality paintball glove, Tippmann Armored Gloves (Hard black/fingerless) is all you need. They are designed with breathable fabric can ensure your comfort in a manner you wouldn’t realize you have them on you. It’s flexible armor protect the knuckles from paintball hits. 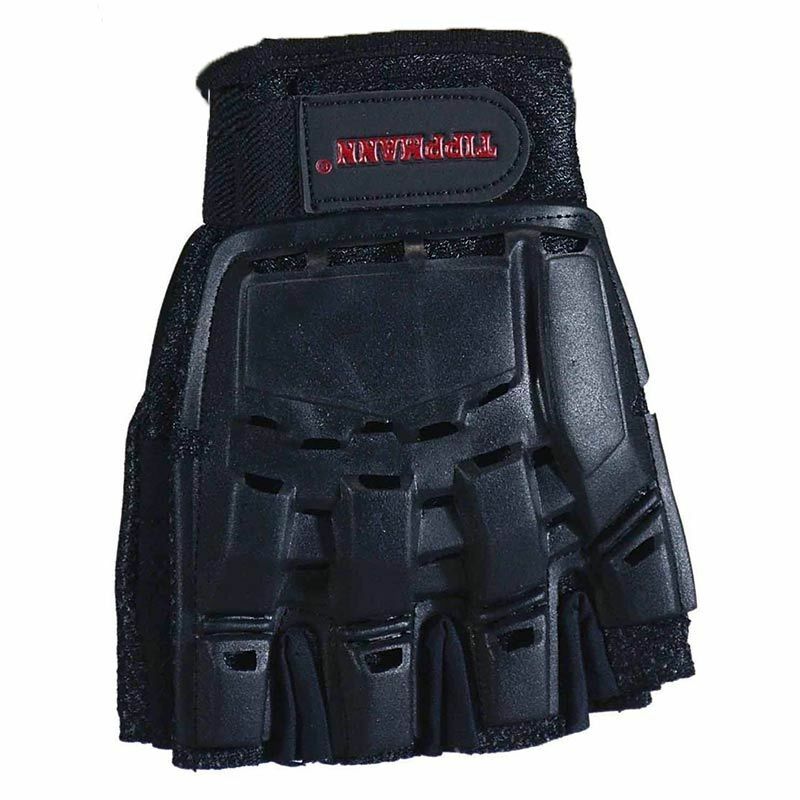 They are incorporated with an adjustable Velcro wrist that makes the fitting and removal easier. As the name suggests its fingers are halfway covered. Its flexible Velcro wrists allow secure fitting and easier removal. Highly durable even after washing. Relatively cheap but deliver as desired. Very comfortable due to the breathable fabric design. 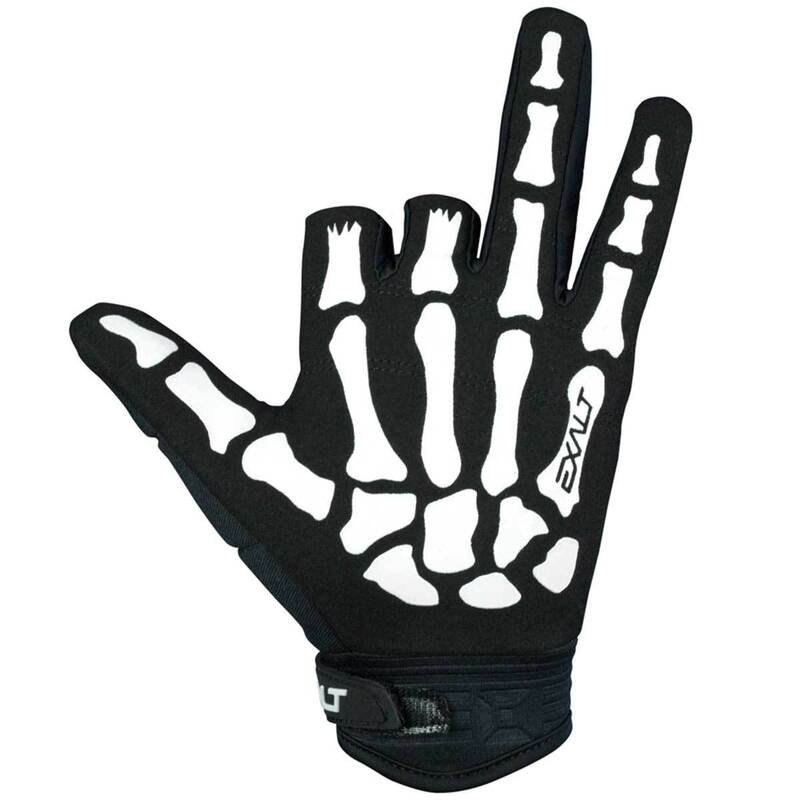 Ideal for persons who love half-fingered paintball gloves. This paintball glove ranks among the few paintball gloves that were manufactured with great design. It does not only look amazing but feels amazing on the hand due to its sleek, formfitting design. Its main features are the neoprene padded hand and the silicone palm grip which give your hand the protection it needs. Like the Bunker Kings Supreme gloves, it comes with a TPR logo as well as a low profile Velcro that helps in its easy release. Very protective as it fits perfectly into the hands. Very convenient due to its lightweight. Suitable as a full finger paintball glove. These were the Top 6 Best Paintball Gloves in 2019. I would suggest you to read all 6 best paintball gloves reviews and take the decision wisely. All 6 paintball gloves are chosen wisely. Hope you enjoyed reading this article and this article. If you did please leave a comment down below. I would be happy to read your comments.